So far in 2018, we have seen significant flooding in many different parts of the country. In addition, the hurricane season of 2017 caused some of the most severe damage and devastation the country has seen in years. 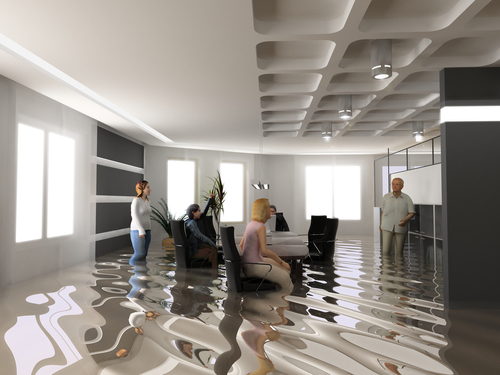 Therefore, preparing your business to endure flooding as well as arrange a proper flood restoration plan is essential. When it comes to flooding, preparation is vital. If you don’t take time to make the necessary steps, there’s not a lot you can do once flooding starts. Acting now can help you establish more substantial protection for your employees and customers against dangerous situations as you evacuate the building. Preparing now can also help ensure that your assets and essential business documentation will be safe and secure. If you’re not facing dangerous situations, here are the critical things you need to remember. Have a good evacuation route. Flooding can very quickly make roads impassable and inaccessible. Thus, try to figure out which areas will be the best route for you to take and are away from danger. Have an emergency kit. Your emergency supply should have the basics: several large containers for clean water, a week or two’s amount of perishable food items, a first aid kit, water purifying supplies, a battery-powered radio, and personal hygiene supplies. Consider insurance and flood insurance. Even if you are not in a flood-prone area, you may still consider getting flood insurance. With many insurance companies, as soon as rainwater hits the ground, it’s considered flooding. So it’s essential to learn how rainwater incursion could affect your business status and operations. Protect business-specific information. Always make backup copies of relevant paperwork (legal documents, insurance information, sensitive business instructions, vendor and client information), and keep them in a spot that won’t be reached by flooding. Prepare your commercial property. Do what you can to protect your assets and building – no matter how big or small these preventative steps are. For instance, clean the storm drains and gutters regularly. If there is a basement, don’t store anything valuable in it. If you have no choice but to use the basement as storage space, have a good plan for retrieving the essential items as part of your flood restoration strategy. If there fuel tanks located in the basement, make sure that they follow local codes. If you predict a need for a sump pump, make sure to get it as early as possible – before flooding season. Make a comprehensive emergency preparedness plan. If you have done the steps above, then you are well in the process of creating a comprehensive emergency plan. Aside from listening and being aware of the latest local weather news and alerts, keep an eye out and be vigilant for any signs of trouble in your immediate area. It’s a scary thought, but as little as six inches of rapidly moving water can sweep someone away. Additionally running water that reaches up to two feet can even move an automobile. Don’t wait to act or move. As soon as you see water rising from the ground, figure out what the official recommendations are for evacuations. Learn what other measures you need to take. Consider the best evacuation routes. Your safety is the priority. However, if there is time, make sure to grab essential documents and data. Ideally, you should have backup copies of important papers at a different safe site. If that’s not the case, only get the most important documents if the situations allow. Once the flooding has passed, the most important thing to ensure is that everyone is safe. Once you have checked that everyone is accounted for, the flood restoration and remediation plans can begin. Extents of water damage may differ in every property. Thus, careful evaluation and monitoring are vital. Business property owners may employ qualified restoration professionals to aid them in any water damage scenarios. I’ve made my living as a heating and air conditioning technician for better than 25 years. Married to Nancy, the love of my life and best friend. I look forward to the part of my day when three terrific young men call me Dad. Always a loyal Iowa Hawkeye football fan.